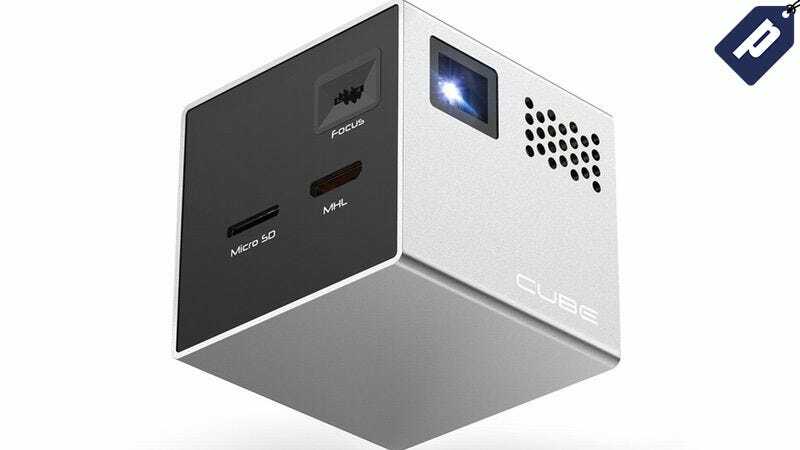 The Cube by RIF6 is a tiny, lightweight, mobile projector and easily hooks up to your smartphone or laptop so you can project movies or any other media to a clear 120" display. It’s normally $300, but Deadspin readers can get one today for just $229 with free shipping - the lowest price on the web. The Cube offers a king-sized display for any MHL or HDMI device (most smartphones, laptops, and media players). It’s just two inches square, rechargeable, and easy to take anywhere. The picture is crisp, and the cube has a built-in speaker for audio. You can also plug in a microSD memory card to play media directly, and the projector comes with a remote control, plus a small flexible tripod so you can get the perfect angle. The Cube makes for a great holiday gift, and you won’t find a better price than this. Order now and save $70 off MSRP, plus free shipping to anywhere in the Continental US. Hit the link below to learn more.